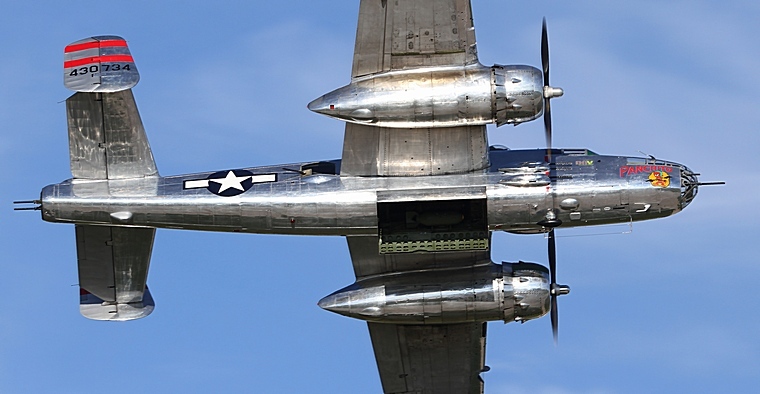 The North American B-25 that had its first flight in August 1940 and of which almost 10,000 were build was named in honour of General Billy Mitchell, a pioneer of U.S. military aviation. Mitchel who at the end of WWI commanded all American air combat units was a proponent of the Bomber as a cheaper and more effective alternative than warships to protect coastlines and he believed that airpower would be vital in future wars. His views antagonised many in the military and when he accused Army and Navy leaders of almost treasonable administration for investing in battle ships instead of aircraft carriers. He was court-martialled for insubordination and resigned soon afterwards. His views soon proofed to be correct and following his death and his rank was re-instated. North American was no strangers to aircraft manufacturing. It produced the full spectrum of aircraft, from trainers to bombers all of which were to become legends. The company was the largest producer of aircraft in the war by far. The Mitchell was the result of North American's response to a proposal by the United States Army Air Corps (USAAC) for a shoulder wing twin engine tricycle gear attack bomber capable of carrying 1, 200lb (544 kg) of bombs and with armaments in the nose, dorsal and ventral positions. The prototype powered by two Pratt & Whitney R-1830-S6C3-G Radials of 1,100 hp (820 Kw) had its first flight in January 1939 with Paul Balfour at the controls. The Pratt & Whitneys were soon replaced by more powerful Wright Cyclones of 1,300 hp (969 Kw). North America delivered the prototype, NA-40-2 to the USAAC for evaluation in March 1939 where it unfortunately crashed because of pilot error two weeks later. The USAAC however was impressed and North American was tasked to continue development of the NA-40 for the medium bomber role. In September 1939 development of the basic design of the NA-62, the company's designation was completed. The NA-62 included several improvements; the fuselage was widened to allow the pilot and navigator to sit side by side, the wing was relocated to mid-position, new Wright Cyclones of 1,700 hp (1268 Kw) were installed resulting in a higher bomb load and a tail gunner's position were added. A contract for the construction of 184 aircraft designated B-25 were placed and the first production model flew on 19 August 1949. 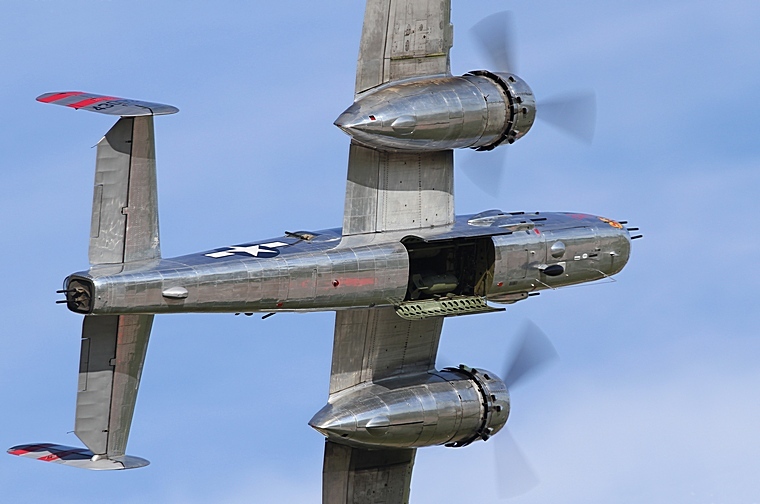 The B-25 of which almost 10,000 were built entered service in 1941 and served with the forces of all Allied forces including the Soviet Union, Brazil, Chile, Mexico, Uruguay, Colombia, Cuba, Peru, Venezuela, China and Indonesia were the last retired in 1979. It was in Egypt in 1943 that B-25s first saw action. Replacing the Douglas Bostons and Lockheed Venturas the new kid on the block served with distinction during the battles of El Alamein and seeing action for the rest of the North African campaign. During the invasion of Sicily and the advance into Italy it was mostly used in the ground attack role, strafing road and rail links disrupting the re-supply of the Axis Forces. 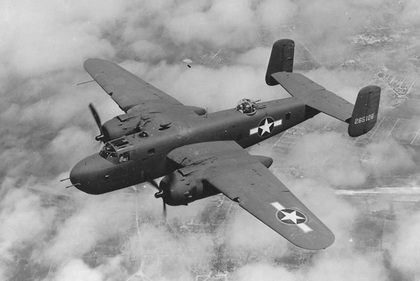 Except for the Italian and North African campaigns US Forces did not use the B-25 in operations in Europe. The mainstay of its bomber forces in the European theatre was the Boeing B-17 and Martin B-26 Marauder. The Royal Air Force (RAF), an early customer via the Lend-Lease program was the only user of the B-25 in raids against the German Forces in Europe initially in the ground attack role but with the invasion of France more and more B-25s operated in the pure tactical bombing role. The last of the Mitchells operations in Europe took place in May 1945 when 47 aircraft strafed the marshalling yards at Itzehoe. It was in the Pacific that the Mitchell really showed its mettle. Island hopping and deployed operationally in Papua New Guinea, Saipan, Okinawa Burma and Iwo Jima the dense tropical jungle terrain forced it adept and its role changed again to that of a ground attack aircraft. However, it was not only over land that the B-52 excelled. Units of the Marine Corps were equipped with PBJ-1 Mitchells in March 1944. The PBJs whose primary mission was the long range destruction of Japanese shipping were equipped with eight five inch rockets carried on under wing pylons. In the anti-shipping role it did real damage to ships of the Japanese Navy, sending many to the bottom. One mission above all others ensured that the Mitchell became a legend. 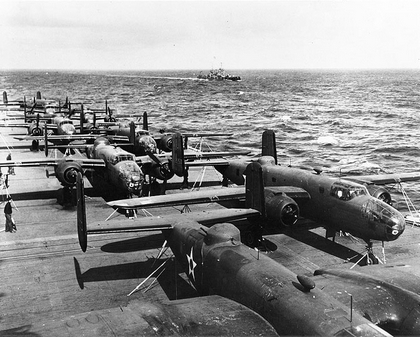 On 18 April 1942 sixteen B-25s led by Lieutenant Colonel Jimmy Doolittle took off from the USS Hornet. They would not return to land on the carrier, it was to be a one way trip. Their mission was to bomb Tokyo and four other Japanese cities and then flew with ever dwindling fuel onwards to crash land in fields in Eastern China. None were shot down. However, of the sixteen that started the mission only one bomber survived intact. It landed in Siberia, Russia where its crew was interned and the aircraft confiscated. The other fifteen crashed landed as planned in Eastern China, eleven of the crew compliment if eighty did not survive. The Mitchell was loved by its crews for its strength and ability to withstand punishment. One specific aircraft, a B-25C of the 321st Bomb Group earned the nickname �Patches�. After every mission the crew chief would paint the patches applied over flak holes with high-visibility zinc chromate primer. After the war �Patches not only sported over 400 patched holes but had survived an incredible 300 missions and six belly landings. That remarkable strength would not safe a U.S. Air Force B-25D that was on a routine training flight on a typical New York foggy day on 28th of July 1945. On board was Captain William Smith at the controls and two crew members. They got caught in the fog and collided with the Empire State Building. The B-52 hit the building between the 79th and 80th floors killing eleven people inside. None of the occupants of the ill-fated aircraft survived. The Mitchell was one of only a handful off aircraft that saw service in every combat theatre during WWII. It caused devastation over the urban sprawls of Europe, wreaked havoc over the deserts of North Africa and brought death and destruction over the jungles and seas in the Pacific. Billy Mitchell would have been proud of the pugnacious bomber that carried his name.